SPF Paker LLC in Almaty once again takes part in the Kazakhstan International “Oil and Gas” Exhibition – KIOGE 2017. This year is anniversary for the KIOGE exhibition, and for the 25th time it brings together over 250 companies from 25 countries of the world and thousands of visitors during this grand and unique event in the oil and gas industry. Every year more and more international experts and specialists choose the KIOGE as a platform to discuss the most important issues of the oil and gas industry development throughout the world community. Primarily, this year KIOGE exhibition and conference cover many important topics regarding companies activity under conditions of low oil prices, attracting investments and improvement of oil production effectiveness and SPF Paker LLC has a lot to offer. The October “Paker” is an expert in the field of engineering and production of oil and gas underground equipment to survey, test and develop wells and down-hole equipment for gas distribution points (GDP), reservoir pressure maintenance (RPM), dual completion (DC), dual injection operation (DIO), etc. The most visitors’ interest of SPF Paker LLC stand was attracted by such packer assemblies as: 2PROK-SO, 1PROK-IVE, 2PROK-IVEG, 1PROK-ORE, 2PROK-ORZ, 2PROK-ORZ, etc., and packers PR, P-EGM, P-EMO, which allow to reduce costs for remedial cementing jobs (RCJ) in wells. The products of the company SPF Paker LLC meet the highest world quality standards. 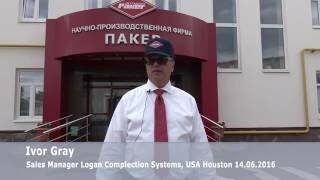 Many visitors of the SPF Paker LLC stand are the company’s partners or have heard about it. Guests who first got acquainted with the company's products were interested in such issues as buying packer and anchor equipment, services of SPF Paker LLC, delivery of equipment, as well as an opportunity to visit SPF Paker LLC with an excursion to get information on the production culture and the company history.